Chahine will provide an overview of how brands can leverage typefaces to help reduce driver distraction and ensure brand consistency. Dr. Nadine Chaine, Arabic type and legibility specialist for Monotype, will present on type and legibility at the International Quality & Productivity Center (IQPC) 7th International Connected Vehicle Conference, Jan. 29-31, 2014, at the Linder Congress Hotel in Frankfurt, Germany. Scheduled for Jan. 29 at 2:20 p.m., Chahine will present, “Typefaces, Branding and Legibility,” examining how typefaces can be designed for brand identity and legibility, while helping to reduce driver distraction. Chahine will present data from an MIT AgeLab study that showed that certain type styles can make a difference in reducing glance time away from watching the road when driving while interacting with in-vehicle displays. She will also discuss her recent Ph.D. research which offers a new definition of legibility that is rooted in studying the visual characteristics of text and eye movement in reading. To read more about Chahine’s Ph.D. research, click here. Full results of the MIT AgeLab study, which was also sponsored by the New England University Transportation Center and Monotype, are available in an MIT AgeLab white paper, in addition to a video that highlights the research and its findings. An award-winning type designer, Nadine was honored in 2012 as one of Fast Company Magazine’s 100 Most Creative People in Business. 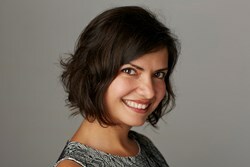 Her designs include the Frutiger® Arabic, Neue Helvetica® Arabic, and Koufiya™ typefaces. She holds a Ph.D. in arts from Leiden University in The Netherlands. Monotype, Helvetica and Frutiger are trademarks of Monotype Imaging Inc. registered in the U.S. Patent and Trademark Office and may be registered in certain jurisdictions. Univers is a trademark of Monotype GmbH registered in the U.S. Patent and Trademark Office and may be registered in certain jurisdictions. Koufiya is a trademark of Monotype GmbH and may be registered in certain jurisdictions. All other trademarks are the property of their respective owners. ©2014 Monotype Imaging Holdings Inc. All rights reserved.